Thank you for visiting this Blog. It is retuning to sharing my research on the Worthington Surname. A new Blog has been established for this User and how the Family Tree Maker program is used to capture and record Genealogy Research. Please visit this new Blog. On the Plan or Opening Screen, is a list of Tasks to be done in this file and some notes that I want remind me of what or why somethings are in this file. When the Task is created (topic and details later) there is a choice to place a priority on the task or note. This is the High Priority List in this file. This contains the Task Description, the Task For, Category / Location, Due, and the Date Created. Remember that this is just a summary. Task Description – A brief description of the Task or Note. For example, the first one is “?? Fort or Ft. ??” . It is marked as Follow Up in the Category / Location column. This is a note for me to make a determination on how I want to “name” a military location, like Ft. Dix, New Jersey, in the Location or Description fields. Task For – In the screen above, the Task For is a General Task. In another part of the full Task List, might contain the identify (and link) to a specific individual that needs to be followed up on. Due – A Date can be entered here. The Date of Completion will be entered when the Task Is completed. Date Created – The date when the entry was created. My use of this feature is to remind me what I am doing and why AND a ToDo List that need to be followed up on. In an earlier Blog Entry, the full opening (Plan) screen showed that there are several Family Files that are being used. Each file, when opened, will bring up its own ToDo List. This is a summary of the Menu’s available from most screens. This is a listing of Menu selections under each of the above Menu Items. The Menu selections may or may not be active on the specific screen that you are on. Date Calculator – Helps you calculate the date of an event, the amount of time between events, or the age of a person. Relationship Calculator – Shows how two people from the tree file are related. Soundex Calculator – Displays the Soundex code for a name. Resolve All Place Names – Helps you find the correct spelling for a place in your tree file. Compact File – Reduces the memory size of the tree file while fixing possible database errors. Convert Names – Changes the surnames in the tree file to either mixed case (capitalize the first letter of the name) or upper case. User Information – Lets you enter your personal information so it can be included on charts and reports. Plugins – Lists the applications that work with Family Tree maker to extend its functionality. All of the installed plugins are listed in the Manage Plugins dialog box. For information about installing plugins and how they work, see the documentation that comes with the plugin. Options – Opens Family Tree Maker’s system settings. Training Tutorials – The Family Tree Maker website will open and let you run various Online Tutorials on the use of the program. Register Family Tree Maker – Ancestry.com offers registered users of Family Tree Maker the following special benefits: the powerful Family Tree Maker Web Search feature and the ability to merge Ancestry.com records into your tree; access to dynamic maps; discounts on future versions of Family Tree Maker; and notifications of updates. Activate Ancestry Subscription – If you are already a member of Ancestry.com or if a free membership came with your Family Tree Maker purchase, you can activate your subscription within the software. Once you’ve activated your account, you can use the Web Search feature to merge Ancestry.com records into your tree. Check for Update – Ability to check to see if there are any updates to this version of Family Tree Maker. About Family Tree Maker – Will provide the current Product Version of the program. 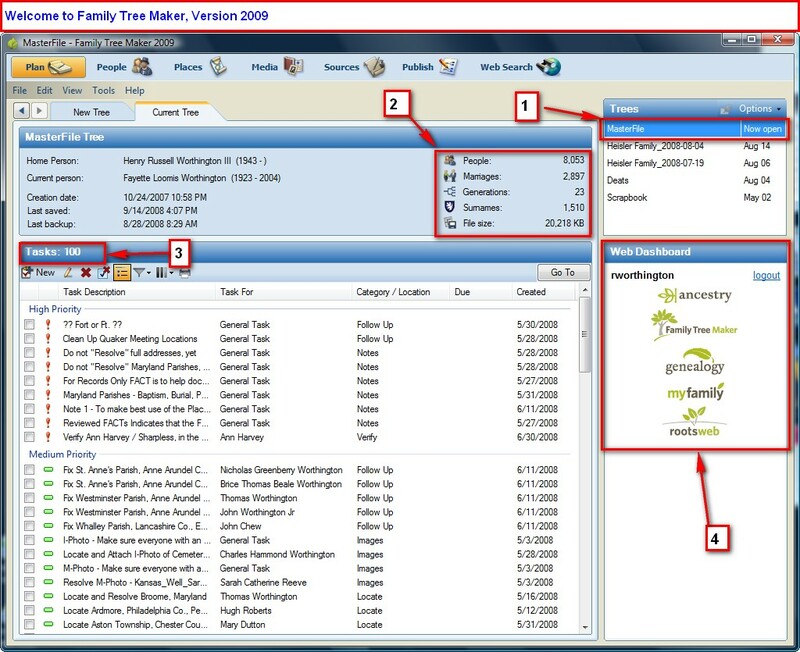 [ Family Tree Maker 2009, Version 18.0.0.95 is the current version ]. Information from this screen is important when seeking help from the various Message Boards and Email lists that address the Family Tree Maker program. The Getting Started Guide can also be viewed as a PDF on your computer. If you chose to include the guide when you installed Family Tree Maker 2009, follow the steps below to find and read the guide. If you didn’t install the guide on your computer, you can find it on the CD-ROM. Double-click the My Computer icon on the desktop. Double-click the icon labeled C: (the default location for installing programs). Double-click the Family Tree Maker 2009 folder (or the folder you chose to install the software in, if different). Double-click the Getting Started Guide (Guide.pdf). If you are not able to view the PDF version of the manual, you will need to install Acrobat Reader, which is available for free download from the Adobe website <www.adobe.com>. Family Tree Maker Version 2009 is here. I have just installed the program and plan on educating myself in its use, and plan on sharing some of my learnings on this blog. The opening or Plan screen is below. There is a lot of information on this screen. I will try to indicate what information is here that may be important to others. This screen is the opening screen of the current file that I have opened. The Home Person, the Current Person is listed, along with the Date that the file was created, Last Saved, and Last Backed Up. Don’t be confused by the Date the file was created, as it was created by Version 2008 and opened by Version 2009. This happened automatically upon installation of Version 2009, as expected. What is obvious, is that a Back Up of this file be done soon. Once the file is backed up, that Back Up date will be updated. 1 – Is the list of files that have been opened, the Date when they were last opened, and the file this is currently opened. In this case, MasterFile is currently opened. 2 – Indicates the number of People or Individuals in the file, the number of Marriages, Generations, and Surnames included in the file, along with the Size of this File. 3 – A list of Tasks (or ToDo List) that has been entered in General or by Individual. This will be covered in more detail in another Blog Entry. 4 – The Web Dashboard indicates that I am logged into various online offerings at The Generations Network. There is a link to Log Off of these websites, if I so choose. As the Plan Button on the Family Tree Maker Tool Bar has a different color, that is the screen that is currently opened. Other buttons will be high lighted in future Blog Entries. Here is a link to the Ancestry.Com BLOG about the Version 2009 Update. Please read an update, at Comment #72 for an update addressing problems with updating to 2009. You are currently browsing the archives for the Family Tree Maker category.